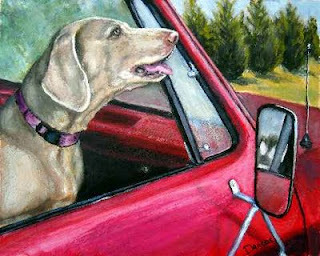 Weimaraner in Red Pickup Truck - Oops, I forgot to post this painting! This is a painting I finished last week and forgot to post! It's a weimaraner belonging to a friend/customer of mine, who loves her weimer! I did a commissioned painting for her of this same dog, the one where she's lying down, with one paw out front, looking wistfully at the viewer. It's not too far back in my posts if you haven't seen it. Anyway, this was a lot of fun because of the red truck and the glass and the reflections. I hadn't had any experience with such things, so I learned a lot from it. Hope you like it. Unlike most of my paintings, it's in acrylics as usual, but it's on a heavy watercolor paper, which I wasn't crazy about painting on, to be honest about it. First of all, it ate my poor hand up; it's really scratchy, which surprised me. Also, not being a watercolorist, I didn't realize how much watercolor paper soaks up any moisture. I like rich, saturated color, so I really had to lay the paint on - over and over and over! I'm finally happy with it, though. But I won't use watercolor paper again with anything but watercolors, if I should ever decide to give them a try. I've been away from painting for a while as you know, and I still don't have my supplies, so this little guy is on watercolor paper, which for me, with my acrylic paints, has been quite a challenge. But I think it turned out pretty well under the circumstances. The photo was submitted by a "fan" of mine, and for her submission, she's getting a free full-sized png file to print in whatever size she chooses. 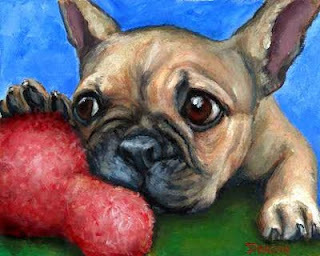 That's my deal: submit photos of a preferred pure-breed dog or cute cat or other animal that I might be interested in painting, and if I create a painting from the photo, you get a free print of it. I've made this offer directly to some people in the past who wanted a commissioned painting done (which again, I'm taking a hopefully permanent break from doing), and I think I offended them by making the offer. But those of you who just want a free print of a painting of your dog, you're more than welcome to submit photos to me. I must make the usual statement, though, that I continue to hold all copyrights to the painting, including the right to reproduce and sell prints of it. Also, in most cases, the original painting will be for sale, too, with you, the person who submitted the photo(s), getting a 10% discount on the price of the original painting. If you're interested, just email me, dottie@dottiedracos.com, and I can give you more details. I'm currently working on a painting of a weimaraner in an older red truck. I expect I'll be able to finish it and upload it by early next week. So far, I'm rather pleased with it, but again, it's on watecolor paper, so it's a more difficult surface for me to work with. My shipment, I found out yesterday, is on its way!!! Finally! It should arrive in Denmark, at least, on around August 4. I am so excited to get all my "stuff." Was it worth the price of shipment? Most probably not, but it's my "stuff," and I've already paid for it, so I'm really looking forward to getting it.